Apple has been steadily building a sizeable portfolio of patents related to NFC and mobile payments over recent years, from as far back as 2009. NFC World+ has reported on these as they have been published and links are provided here to details of 23 patents covering technical innovations and use cases in payments, mobile marketing, coupon delivery, gifting, event ticketing, content sharing, travel and beyond. A ‘Touch Screen RFID Tag Reader’ patent application was published describing how an RFID antenna could be placed in the touch sensor panel of an iPhone so that the touch sensor panel could then function as an RFID transponder. A rumour that Apple had developed an RFID-enabled iPhone prototype was quickly followed by an Apple Grab & Go patent application that provided details of how NFC could be used to make it easier for customers to transfer files between devices such as the Mac, iPhone and Apple TV. A patent application saw Apple using the term ‘trusted service’, hinting at the company’s potential to play a pivotal role as a Trusted Service Manager for mainstream mobile applications and, perhaps, for mobile payments and NFC. 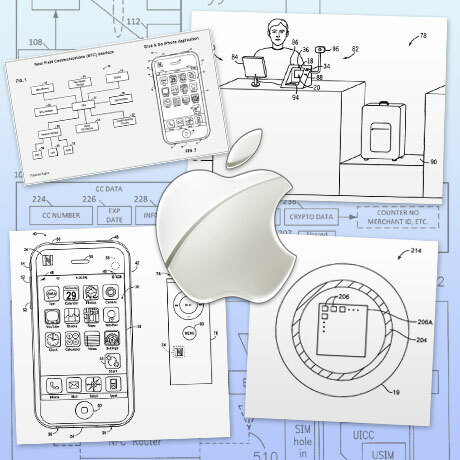 An NFC-enabled iPod, games controller, TV and iPhone patent application outlined a vision of a connected living room, where resources are shared with a tap. Four patent applications relating to an NFC-based mobile payments service using iTunes credits described how consumers could make payments to merchants and other consumers via a credit or debit card, directly from their bank account or using credit stored in their iTunes account. The ‘iPay, iBuy and iCoupons‘ patent pair described a comprehensive mobile payments, mobile commerce and mobile marketing business based around an NFC-enabled iPhone, obscured under the names ‘Smart Menu Options’ and ‘Real-Time Bargain Hunting’. An NFC-based concert, entertainment and sports venue ticketing application was revealed. Concert Ticket+ includes the concept of providing exclusive bonus features for users of Apple devices. An airline ticketing and boarding pass application was published, describing an unmanned, automated airport ticketing and baggage counter kiosk. The patent application introduced the concept of an automated security checking process where users of an iTravel app could process themselves through the security clearance system and check themselves in at the boarding gate. The patent was granted in 2012. Products+, an NFC-based product marketing and promotions patent application was published, covering the use of an NFC phone to read a tag on a consumer product in order to obtain a benefit provided by the manufacturer or retailer. An iKey patent that would enable users to replace door keys and access buildings with their iPhone was also published this year and reported by Patently Apple. Apple was granted a patent covering the addition of an NFC antenna to electronic devices with a metal display, such as computer monitors, where standard methods of integrating NFC may cause problems generating a sufficiently robust signal strength. The ‘SIM within’ patent application set out a way for a virtual SIM card to be built into an embedded secure element which could, in turn, be attached to an NFC controller chip. Apple was granted a patent for Parental Controls, a wide ranging system for tying together multiple subsidiary accounts within a mobile wallet application. The patent makes extensive reference to the use of NFC as well as to both payments and loyalty cards. A patent for gifting digital content to friends using transmission methods including NFC was also published, outlining a two-step confirmation process. An ‘On-the-go shopping list’ patent was revealed that referenced the use of NFC extensively for scanning products to obtain further product information or to add the product to a shopping list. A patent outlined a way that consumers could use NFC to gift media between iOS devices. A variety of ways in which Touch ID could be combined with NFC by combining both fingerprint biometrics and NFC functionality into the home button of a mobile phone was revealed in a patent application which also showed that Apple was working on a variation of NFC that uses “body coupled communications.”. Apple published a patent application that describes the use of a secure element in a mobile phone to store cardholder data, NFC to initiate a transaction and Bluetooth or WiFi to complete the processing of a transaction in a store and return coupons and other information to the customer’s device. The company also applied for a patent on an antenna design that allows NFC signals to be transmitted from both the top and bottom of a mobile phone — front and rear — reducing the need for a user to orientate their device in a particular way when conducting an NFC transaction. Apple to use tokenization for mobile payments?